2x display "Curved Plus S"
The "Circle" is an extremely lightweight pop-up display with a semi circle shape. The set includes the display with print, the box for transportation with print and 4 spotlights. 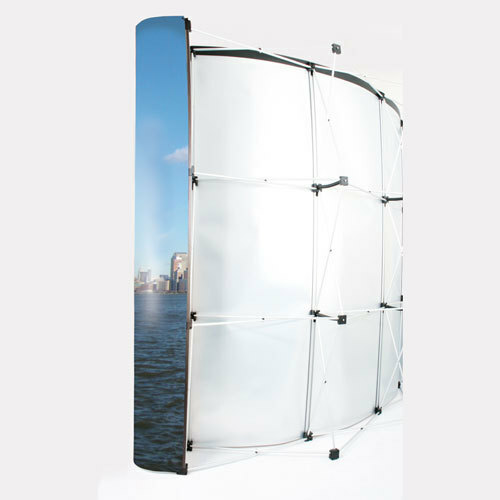 Built up within a few minutes without any further tools, the exhibition frame "Cirlce" will offer you a broad space to display your advertisement in the best way. 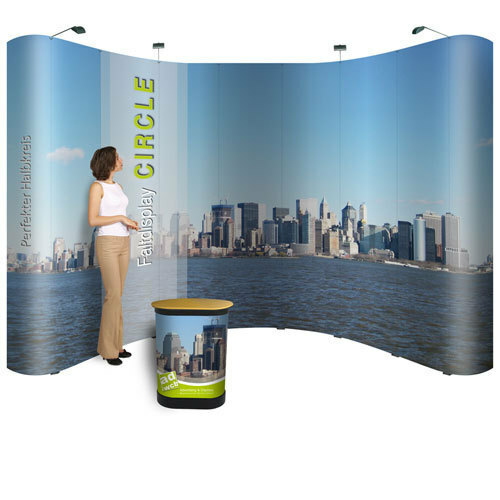 The exhibition display "Circle" is an extremely lightweight, semi-circular curved pop-up display for an eyecatching large format presentations on fairs, events or as presentation wall. It consists of two individual exhibition displays with folding fence system which create an impressive advertising space together. 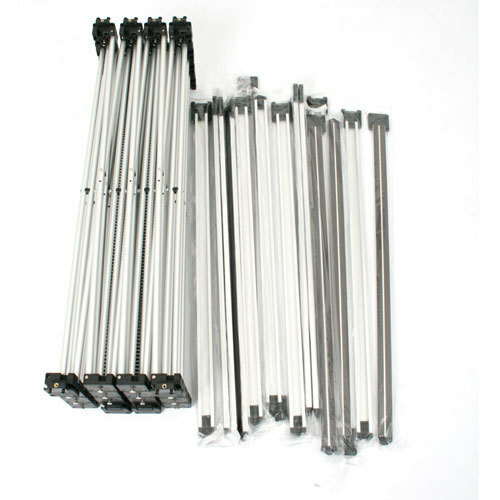 Your printing motif will be printed on 9 sheets, which will be attached at the construction. The display system will be covered invisibly by the sheets. The transport boxes are also usable as promotion counter. The hardcase will be covered with an additional print summing to a harmonious picture of exhibition display and counter. The printing according to your printing files for the display and counter are included. 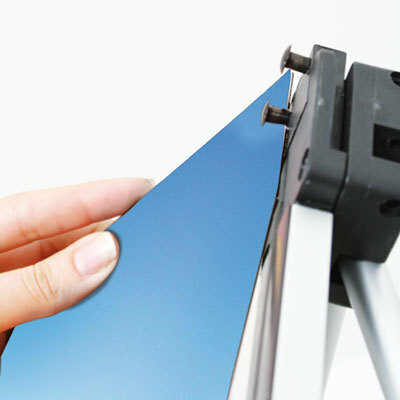 The opaque printing medium makes the display construction completely invisible from the front. 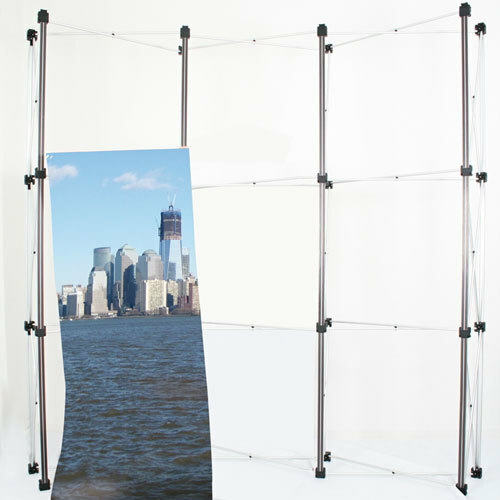 The frame is made of silver aluminum rods. 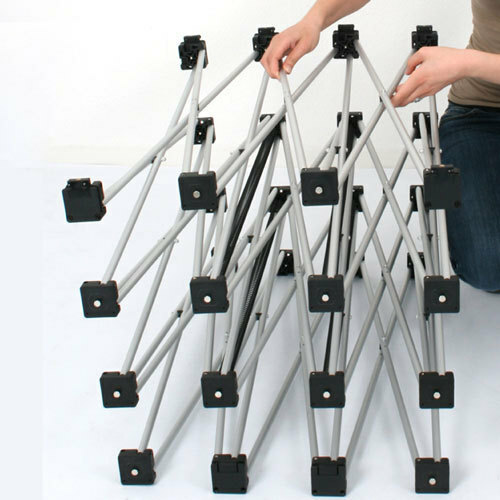 The folding fence system is easy to open out and clap down. 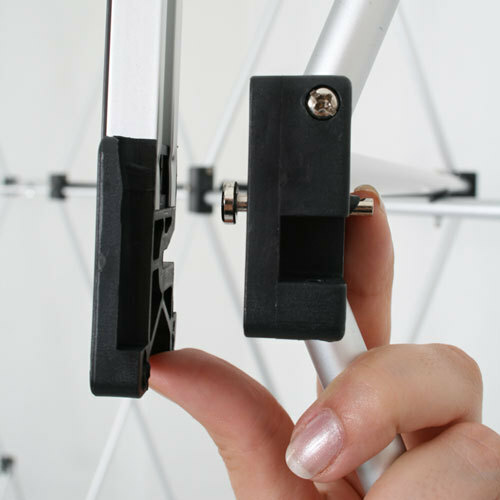 The printing sheets will be hung and additionally fixed with magnetic strips. The transport box includes a tabletop and custom printing. It is useable as an exhibition counter, too. The print will be wrapped around the case and fixed at the back with hook-and-loop tape. For transport the motif printing, the display and counter top can be stored inside the hardcase. We recommend to place no important graphic elements in the sectional areas of the sheets. Suspension of the panels is visible at the front.